We have a hypothetical data file, tobit.dta with 200 observations. The academic aptitude variable is apt, the reading and math test scores are read and math respectively. The variable prog is the type of program the student is in, it is a categorical (nominal) variable that takes on three values, academic (prog = 1), general (prog = 2), and vocational (prog = 3). Let’s look at the data. Note that in this dataset, the lowest value of apt is 352. No students received a score of 200 (i.e. the lowest score possible), meaning that even though censoring from below was possible, it does not occur in the dataset. 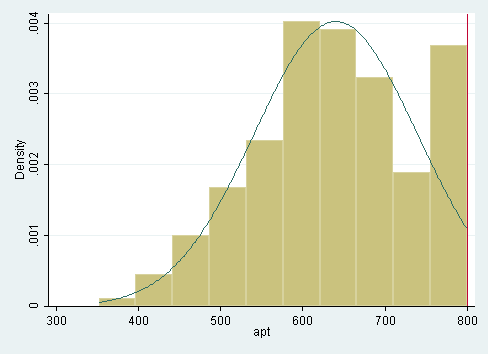 Looking at the above histogram showing the distribution of apt, we can see the censoring in the data, that is, there are far more cases with scores of 750 to 800 than one would expect looking at the rest of the distribution. 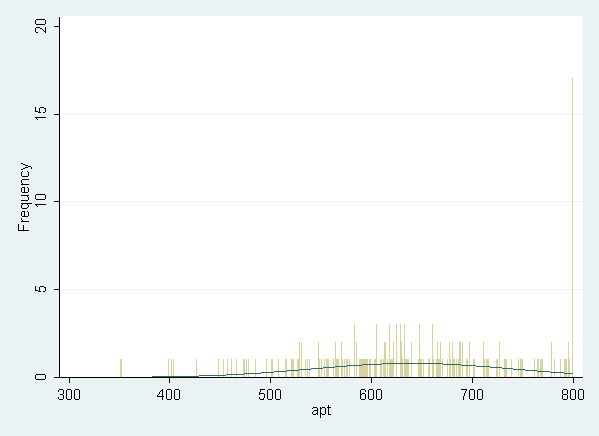 Below is an alternative histogram that further highlights the excess of cases where apt=800. In the histogram below, the discrete option produces a histogram where each unique value of apt has its own bar. The freq option causes the y-axis to be labeled with the frequency for each value, rather than the density. Because apt is continuous, most values of apt are unique in the dataset, although close to the center of the distribution there are a few values of apt that have two or three cases. The spike on the far right of the histogram is the bar for cases where apt=800, the height of this bar relative to all the others clearly shows the excess number of cases with this value. 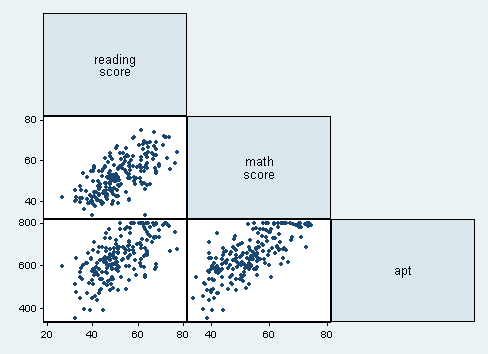 In the last row of the scatterplot matrix shown above, we see the scatterplots showing read and apt, as well as math and apt. Note the collection of cases at the top of each scatterplot due to the censoring in the distribution of apt. OLS Regression – You could analyze these data using OLS regression. OLS regression will treat the 800 as the actual values and not as the upper limit of the top academic aptitude. A limitation of this approach is that when the variable is censored, OLS provides inconsistent estimates of the parameters, meaning that the coefficients from the analysis will not necessarily approach the "true" population parameters as the sample size increases. See Long (1997, chapter 7) for a more detailed discussion of problems of using OLS regression with censored data. Below we run the tobit model, using read, math, and prog to predict apt. The ul( ) option in the tobit command indicates the value at which the right-censoring begins (i.e., the upper limit). There is also a ll( ) option to indicate the value of the left-censoring (the lower limit) which was not needed in this example. The i. before prog indicates that prog is a factor variable (i.e., categorical variable), and that it should be included in the model as a series of dummy variables. Note that this syntax was introduced in Stata 11. The final log likelihood (-1041.0629) is shown at the top of the output, it can be used in comparisons of nested models, but we won’t show an example of that here. Also at the top of the output we see that all 200 observations in our data set were used in the analysis (fewer observations would have been used if any of our variables had missing values). The likelihood ratio chi-square of 188.97 (df=4) with a p-value of 0.0001 tells us that our model as a whole fits significantly better than an empty model (i.e., a model with no predictors). In the table we see the coefficients, their standard errors, the t-statistic, associated p-values, and the 95% confidence interval of the coefficients. The coefficients for read and math are statistically significant, as is the coefficient for prog=3. Tobit regression coefficients are interpreted in the similiar manner to OLS regression coefficients; however, the linear effect is on the uncensored latent variable, not the observed outcome. See McDonald and Moffitt (1980) for more details. The terms for prog have a slightly different interpretation. The predicted value of apt is 46.14 points lower for students in a vocational program (prog=3) than for students in an academic program (prog=1). The ancillary statistic /sigma is analogous to the square root of the residual variance in OLS regression. The value of 65.67 can be compared to the standard deviation of academic aptitude which was 99.21, a substantial reduction. The output also contains an estimate of the standard error of /sigma as well as the 95% confidence interval. Finally, the output provides a summary of the number of left-censored, uncensored and right-censored values. We can test for an overall effect of prog using the test command. Below we see that the overall effect of prog is statistically significant. We can also test additional hypotheses about the differences in the coefficients for different levels of prog. Below we test that the coefficient for prog=2 is equal to the coefficient for prog=3. In the output below we see that the coefficient for prog=2 is significantly different than the coefficient for prog=3. We may also wish to see measures of how well our model fits. This can be particularly useful when comparing competing models. One method of doing this is to compare the predicted values based on the tobit model to the observed values in the dataset. Below we use predict to generate predicted values of apt based on the model. Next we correlate the observed values of apt with the predicted values (yhat). The correlation between the predicted and observed values of apt is 0.7825. If we square this value, we get the multiple squared correlation, this indicates predicted values share about 61% (0.7825^2 = 0.6123) of their variance with apt. Additionally, we can use the user-written command fitstat to produce a variety of fit statistics. You can find more information on fitstat by typing search fitstat (see How can I use the search command to search for programs and get additional help? for more information about using search). intreg — interval regression, in which observations may be point data, interval data, left-censored data or right-censored data.